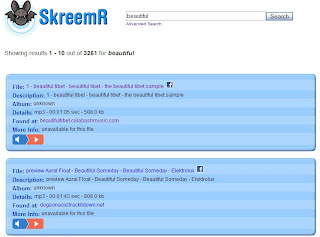 kreemR is a search engine that special for audio file on the web. It is simple to type key words into the search bar, you can also use advance search that uses Mp3 tag information to generate results. Search by title, artist, album, and genre. The result shows you some information and a simple audio player that lets you listen audio file. I think kreemR use web crawl on public sites, so everything is open that mean you can download them. But it also has a problem that is many music are short, because they are sample on the music site. kreemR is an audio search, so some results are not music. But you still can give it a try.